Did you know that nationwide there are 450,000 billboards? I'm assuming this number only includes free standing signs on highways and other roadways and that it does not include billboards in cities that are affixed to the sides of buildings and other similar derivations. The article below from the New York Times speaks about this important issue the country is now facing as digital technology becomes more affordable for outdoor advertising companies. The question of whether or not digital signage is a safety hazard is a hot topic, and cities across the country are weighing in as a precedent has yet to be set. As far as we are concerned this is a moot issue. What is more important is the right this type of signage has in our public in general. 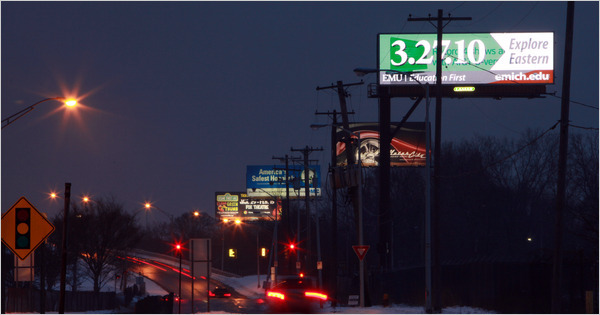 As for the safety issue and digital billboards' tendency to be more distracting than traditional signage, we think this is a pretty easy call. If they werent more attention grabbing, outdoor advertising companies wouldnt be paying immense amounts of money to erect these huge television screens and advertisers wouldn't be paying the 600% markups associated with this type of technology. Remember the whole point of advertising is to grab and hold your attention in order to get you to do something you might not otherwise do, period! There is no debating this fact.